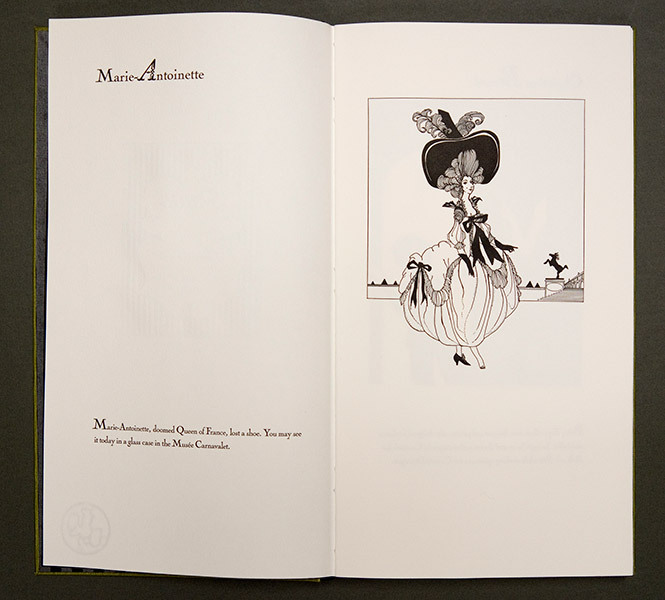 Paris is a delightful alphabet book written and illustrated by fashion designer Christopher Carroll, illustrating his fifty-year love affair with the city of Paris. Carroll has set a sharp eye and wicked sense of humor to work on some of his favorite iconic locations and the charismatic characters that inhabited them. You will encounter Ho Chi Minh in the kitchen of Auguste Escoffier; Oscar Wilde in battle with the wallpaper at the Hotel D’Alsace; and the Surrealist photographer Dora Mar playing a bloody game of “truth or dare” with a kitchen knife. Paris was designed by Peter Rutledge Koch in collaboration with Christopher Carroll and Susan Filter. Text and images were printed letterpress at Peter Koch Printers for del Milion editions. The typefaces are Nicholas Cochin for the text and Fournier Ornate for display. (How could we resist?) The original drawings in cut-paper and ink, were scanned at 42 Line and digitally re-configured under the direction of the printer. 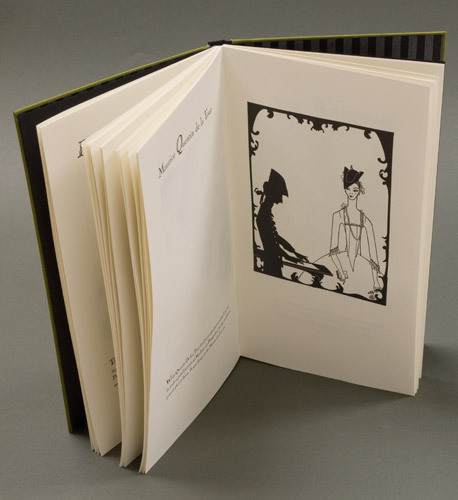 The text and images were printed on Hahnemühle Biblio, presswork from photopolymer-plates by Max Koch. 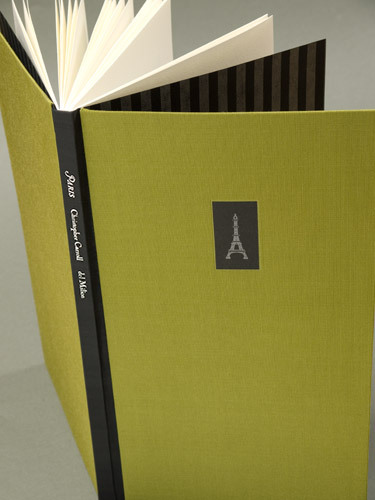 The elegant chartreuse silk-over-flexible-board binding was executed by John DeMerritt Bookbinders.